The UK's government's Brexit secretary has insisted the Scottish Parliament will have "significant new powers" after the country leaves the EU. 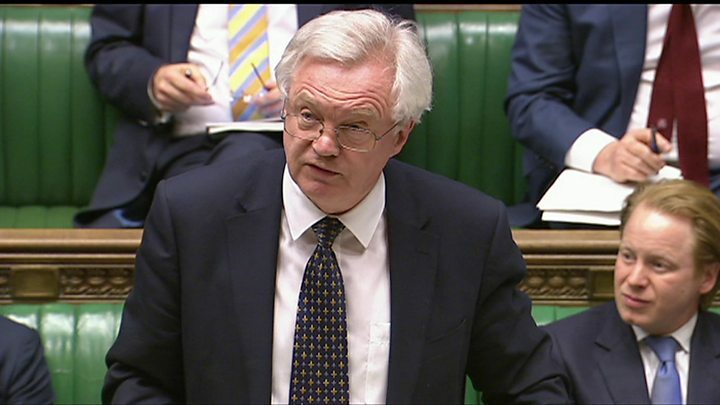 David Davis was speaking in the Commons as he outlined the government's new Great Repeal Bill. At the same time, Scotland's first minister, Nicola Sturgeon, was telling Holyrood that the Conservatives were planning a "power grab" after Brexit. But Mr Davis told MPs his preference was for more devolution, not less. The repeal bill will see thousands of EU laws on everything from workers' rights to the environment scrapped or replaced with UK equivalents. But it has not yet been decided which of these new powers will be kept at Westminster, and which will devolved to other parts of the UK - including Scotland - after the UK leaves the EU. The Scottish government has repeatedly claimed the prime minister is planning a "power grab" because she has not confirmed that all of the powers associated with devolved areas, such as fishing and agriculture, will be handed to Holyrood once they return from Brussels. Ms Sturgeon told the weekly first minister's questions session at Holyrood that the Scotland Act meant the powers should "automatically come to this chamber". But she said nobody in the UK government, including during her talks with the prime minister on Monday, had given her that guarantee. The first minister said this "leads me to suspect that what the Tories are actually planning is a power grab on this parliament, and that will be absolutely unacceptable." A Scottish government spokesman later indicated that it would not give its legislative consent to the Great Repeal Bill unless all powers over fishing and agriculture were given to the Scottish Parliament. However, it is not yet clear whether Holyrood will need to give its consent - although the Scottish secretary has previously said he thinks it will. Adam Tomkins of the Scottish Conservatives claimed that the SNP was "complaining about the return of substantial new powers which, under its plans, would remain in Brussels. If ever people needed to see their utter hypocrisy, this is it." Ms Sturgeon suspects that the EU leg of powers presently devolved, such as agriculture and fishing, may return initially to Westminster - and might get stuck, to some extent. Mr Davis and other Conservatives say that is nonsense. They say agriculture and fishing will be devolved - but within a broader UK framework, replicating to some extent the common standards current promulgated by the EU. That will allow, UK Ministers argue, the maintenance of a UK market in food products. It will help the economy, they insist. Scottish Ministers remain, well, suspicious. Might that suspicion extend into Holyrood action to thwart the process of Brexit? It might, although we have yet to learn the full extent to which the Scottish Parliament will be involved. Mr Davis was pressed on the issue by Labour's shadow Brexit secretary Sir Keir Starmer, who warned him that "Brexit should not be an excuse to hoard powers in Whitehall". Sir Keir added: "There has to be a heavy presumption that devolved matters remain devolved as powers and responsibilities transfer from the EU to the UK." Mr Davis repeated the government's pledge that "no powers currently exercised" by the devolved administrations would be taken away. He said: "We also expect there to be a significant increase in the powers exercised by the devolved administrations. "But I say this - we have to maintain the United Kingdom internal market too. That is four times as important to Scottish businesses, for example, as the European market." Mr Davis later added: "We will have serious discussions with them about this, because my preference is for more devolution rather than less - that is my simple viewpoint. "The constraint on that, however, is where it has direct effect on the whole United Kingdom's interests. "So that is the United Kingdom's market - it would be very bad for Scottish farmers and for Scottish producers if the United Kingdom market became separated from them." Highlighting other areas, such as national security and international obligations in environmental law, Mr Davis said there were "plenty of areas" where it was "clear that we need to have a UK-wide framework". The draft repeal also says the devolved governments will be given powers to amend devolved laws that will no longer operate appropriately after Brexit. It is currently unclear whether Holyrood will need to give its consent for the Great Repeal Bill - with Mr Davis saying he does not know at this stage. The Scottish secretary, David Mundell has previously said he expects there will be a need for consent.